This expedition is based in the Argentine provincial city of Mendoza. The main objective will be an ascent of the seventh highest peak in the Andes, Mercedario 6710m. 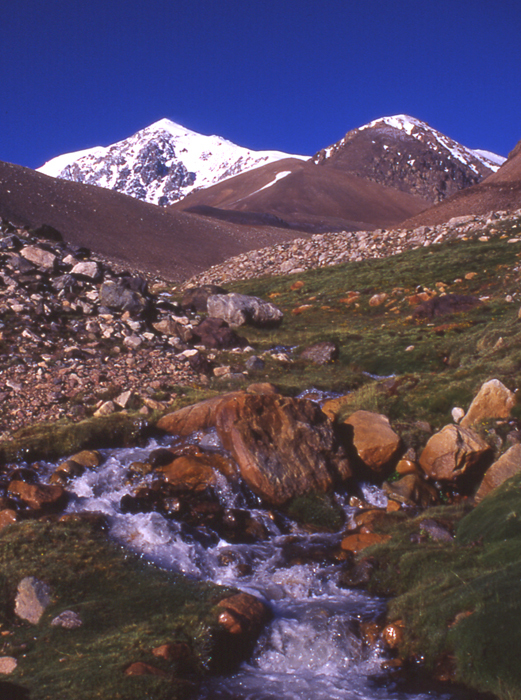 The mountain is a very much quieter peak than Aconcagua which lies about 80km further south. It is an easy ascent suitable for those without much previous experience and once acclimatised the ascent takes about ten days altogether. Mercedario is a mountain with an unusual history - it was climbed by the Incas over 500 years ago to make sacrifices and offerings. On the way up the mountain we pass a small ruin from the time of the Incas at 5200m and even some traces of walls at 6400m. From the summit of Mercedario there are superb views to Ramada, La Mesa and the other peaks in the Mercedario group as well as south to Aconcagua. 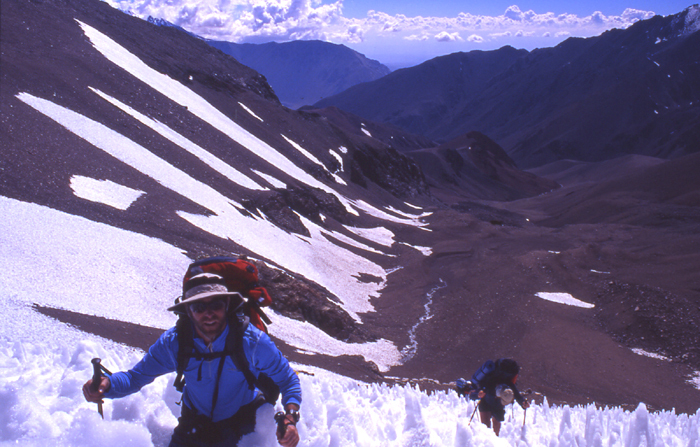 From Mendoza we will make a preliminary trip to the mountains of the Cordon del Plata for acclimatisation purposes. These are a very scenic range of mountains closer to Mendoza. From a tranquil base camp at about 3300-3500m we'll aim to make several ascents of easy peaks in the range of 4000m high, possibly climbing as high as 4800m. 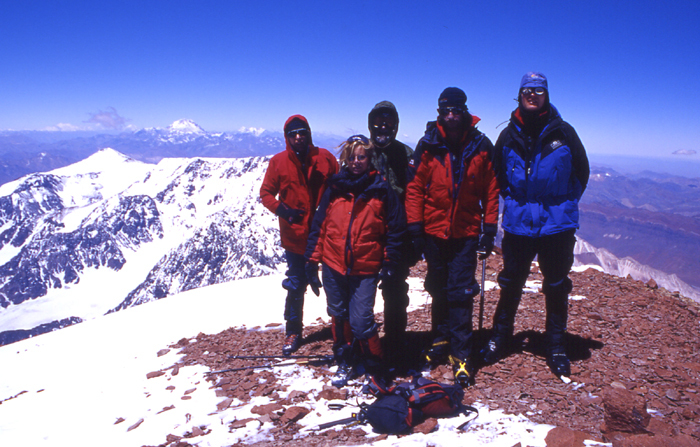 Tom, Gordon, Ray, Barry and Tina on the summit of Mercedario. Mercedario is the seventh highest mountain in the Andes and South America. One of the least frequently climbed of the big peaks in the Andes, it lies entirely in Argentina but close to the Chilean frontier. The mountain has an impressive south face of snow and ice, but a gentler north slope that provides an easy "walking" route to the summit. Mercedario experiences similar high winds and the same occasional periods of bad weather as its southern neighbour Aconcagua. 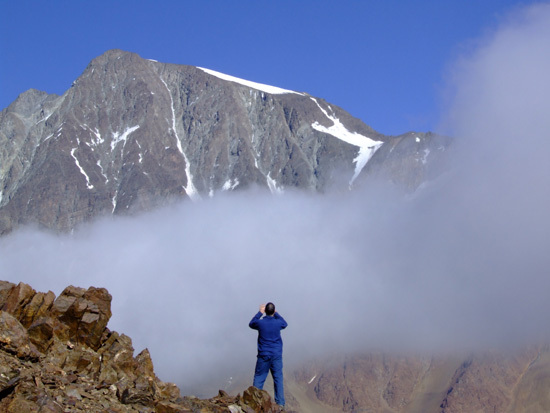 The normal route is on the northeast side of the mountain and although it involves no climbing, it is still a challenge due to the altitude and areas of scree. In most years an axe and crampons are necessary for a safe ascent but previous experience of using these is not essential. The first recorded ascent of the peak was by a Polish expedition in 1934. However the mountain was almost certainly climbed at the time of the Inca empire. There are ruined walls of Inca origin at over 5200m and even at 6400m on the normal route. Mercedario from just below the Guanaquitos base camp. Before going to Mercedario we spend four nights in the Cordon del Plata, a range of lower peaks nearer to Mendoza. This mini expedition is a good chance to get to know each other, get a feel for the conditions and get some acclimatisation before the big trip into Mercedario. We drive to the Vallecitos ski resort at 3000m then walk up into the mountains usually camping at about 3000-500m. If expedition members are feeling fit and well acclimatised there will be a chance to climb one of the many smaller peaks in the range such as Pico Franke 4850m. Depending on flight schedules we may have time to see a little of Buenos Aires during the course of the expedition. Buenos Aires is the capital of Argentina and the third largest city in South America. In the centre of town and on the waterfront of the river there are pleasant parks and restaurants. There is also the usual assortment of art galleries, museums and presidential palaces. Mendoza is a provincial city in the west of Argentina which we know well having run many expeditions to Aconcagua. It is situated in a very dry region in the rain shadow of the Andes and is an agricultural and wine producing area. It is one of Argentina's more prosperous cities, with many tree lined avenues, bustling pedestrian precincts and pavement cafes. The climate at altitude in this part of the Andes is cold, windy and extremely dry. High on Mercedario temperatures can fall to -20ºC at night. During the day it can feel very warm in the strong sun, but it can also be bitterly cold and windy, particularly on summit day. Temperatures in the lower valleys are usually a very pleasant 25-30ºC during the day, but cool at night. It will be very hot in Mendoza and Barreal (up to 35ºC) so don't forget to pack a T-shirt. It should be dry most of the time we are there, although there is a chance of a snow storm in the mountains. Ascents to over 6000m require considerable fitness. Good mountain fitness and stamina are important, but for high altitude expeditions clients also need good cardiopulmonary (heart and lung) fitness. This can only be maintained by a program of intensive exercise such as running, circuit training, squash or cycling. This should be done in small doses (e.g. half an hour every other day) over a period of at least three months before the expedition. If you don't do this sort of exercise you are unlikely to get to the top - Mercedario will be a physically demanding expedition. The normal route on Mercedario is an easy ascent route with few difficulties, suitable for those with extensive summer walking experience plus a little winter and/or Alpine walking experience. We may need to use an ice-axe and crampons for some short easy sections but previous experience of using these is not necessary. Clients should be prepared for cold nights whilst camping and be prepared for very windy and dusty weather at times in the mountains. Clients must be able to carry their share of expedition equipment on their back above base camp. Weights carried will be about 20kg. As we'll be a long way from the nearest supermarket we will have to put up with tinned and/or dehydrated food in our diet during our time on the mountain. All clients are expected to assist occasionally with the routine work of this type of expedition; pitching tents, cooking and washing up. All clients must be insured for medical costs and repatriation. We recommend having insurance for baggage, cancellation and personal liability as well. If you would like advice on insurance please ask. Argentina is one of the more developed countries in South America. Vaccinations for tetanus, typhoid and polio are recommended. The country is very safe and relaxing to travel in; theft and muggings are almost certainly less likely than they are in any British city. This is an adventurous trip and all clients will be exposed to hazards not found in everyday life by taking part in this itinerary. While we take all reasonable precautions to reduce risk it is neither possible nor desirable to completely eliminate these additional hazards. Some of these hazards carry the risk of serious injury or death. It is important that you understand the risks you may be exposed to before signing our booking form. We have identified the following areas as the principal additional risks of this itinerary. This is not a fully inclusive list - please ask if you would like to see a more detailed risk assessment of this itinerary before booking. Driving, hotels and general safety : In Argentina driving, fire standards and general safety standards are not as high as in Europe. Remoteness : You will be camping in a remote area for an extended period and therefore obtaining medical assistance for any problem will be a slow process, taking at least several days. Weather : Mercedario is occasionally affected by severe and sometimes dangerous storms. Forecasts are not so reliable. Altitude : At high altitudes there is an increased risk of medical problems, most obviously altitude illness. Mountain Hazards : In certain places you may be subjected to a slight risk of rock slips. There are river crossings on this itinerary which could become serious. In stormy weather might be a slight risk of avalanche. Our expeditions are designed to be small and flexible. The expedition will be co-ordinated, organised and led by us, but we'll consult and involve the expedition members when planning the details of the trip. Please note however that the leaders decision is final where the safety of the group or any member is in jeopardy; for example where retreat or diversion is necessary due to illness or bad weather. The minimum number of customers we need to run this expedition is three. The maximum size of the expedition will be four customers plus leader. In some circumstances we may be able to run the expedition with just two members and a local leader.